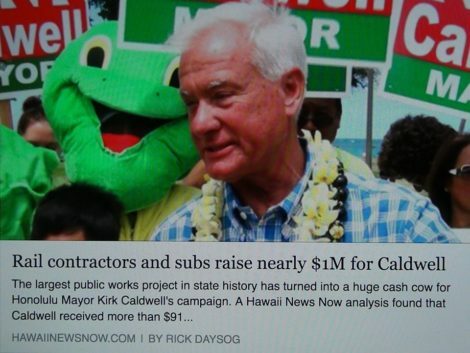 Are Taxpayers Paying for Mayor Kirk Caldwell’s Social Media Posts? What do you think of this facebook post, the day after Thanksgiving 2018? Have you ever wondered what some of the filtered/deleted comments were in the Mayor’s posts? 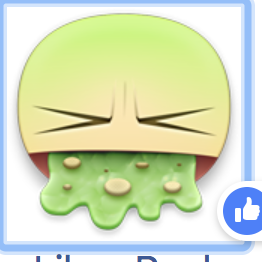 I’ve heard Honolulu Residents who are blocked from the Honolulu Mayor’s FB page. Some comments that I’ve read are pretty witty and caustic but to the point. Some are really funny. I think there are always implanted trolls who praise him or his ventures to hyperbolic proportions. Are we taxpayers paying for these Facebook posts? How many public relations people does the Mayor of Honolulu employ at Honolulu Hale? LydiaLee Kamiya Happy Aloha Friday Mayor! Rebecca Lee Mayor Kirk Caldwell forgets hes white. He thinks hes Japanese. 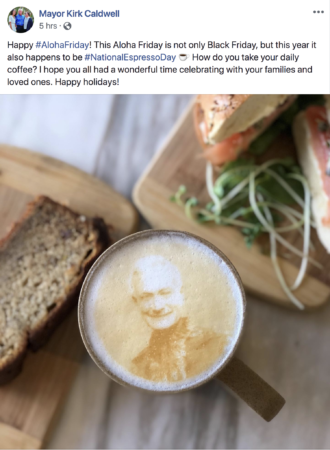 George LaValle Those espresso printers kinda take the fun out of latte art. Sandy Watanabe Amazing! Thank you for your Hard Work! Most Relevant is selected, so some comments may have been filtered out. The Honolulu City and County Mayoral Race is in full swing. The embattled and incumbent Mayor Kirk Caldwell has raised millions of dollars to fund his campaign through social media. The island is now besieged with blood-sport advertisements all over the air-waves. It’s up to the public to discern the facts from fiction. 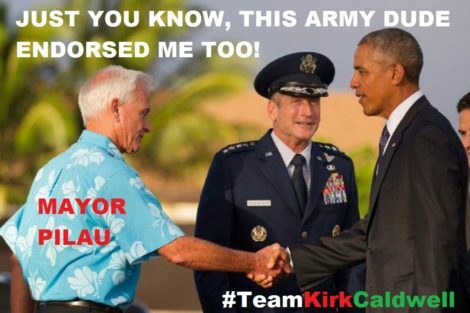 Embattled Mayor Caldwell’s campaign is primarily based on social media propaganda. This, in turn, has resulted in some memes that should air on the Jon Stewart Show. They’re too witty and too funny. 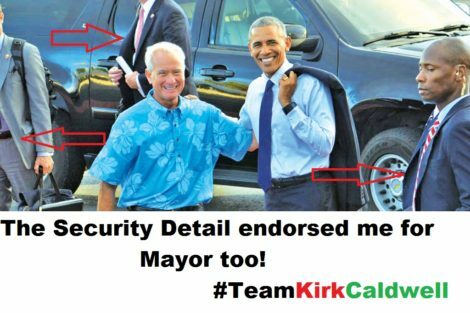 An example: Mayor Kirk Caldwell used a photo version of this August 2016 Greet the President event as his official photo for President Obama’s “endorsement”. 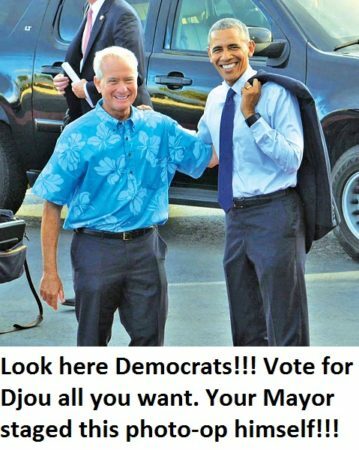 Keep in mind the office of the Honolulu Mayor is non-partisan. It will be interesting to find out which staff member churned out that generic endorsement. We question President Obama’s personal knowledge about it because Mayor Caldwell’s past four years as Mayor of Honolulu is a chronic record of violating civil rights and persecuting the most vulnerable in society. (Various federal judges have ordered the city of Honolulu to pay for damages, attorney fees and settlement.) We cannot believe that President Obama would condone such actions that undermine social justice and equality. 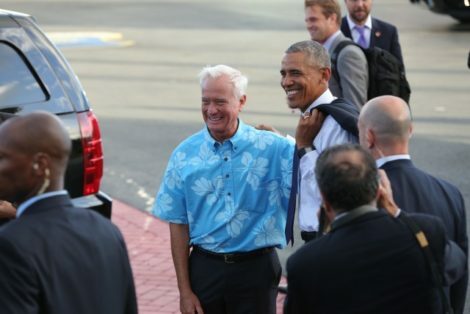 This photo below, taken by Civil Beat, in a the quick protocol greeting by government officials in August 2016 at Hickam Air Force Base.